‘There are no strangers in the town of Near.’ Lexi’s heard this all of her life, so her home becomes an unusual place when a very odd stranger appears—and events turn darker still when his new presence coincides with the nightly disappearances of young children. Long, long ago, the Near Witch lived in a small house on the farthest edge of the village, and she used to sing the hills to sleep. It’s probably pretty evident by now that I am trash for Victoria Schwab’s stories. I think she’s one of the most masterful, brilliant creative minds I’ve ever had the pleasure of meeting, and frankly, she could publish grocery lists and I would pay good money for them. All of that is to say that, when I learned her long out of print debut novel was being re-released, I was beside myself with glee, but also a little bit nervous, because it can be hard to go back to a beloved author’s roots—after all, not everyone starts out a pro, right? If the moor wind ever sings, you mustn’t listen, not with all of your ears. Use only the edges. Well, ha. I worried for nothing, because I opened this gorgeous book, read the first paragraph, and, friends, I’m not exaggerating when I tell you I gave the loudest, most wistful sigh. I was home. Victoria’s writing was just as gorgeous then as it is now, and frankly, if you don’t like rambling “gush” reviews, you might as well close this now, because I just want to get emotional and cry at you all a little over how much this story meant to me. The wind is lonely, love, and always looking for company. First, this setting? Flawlessly atmospheric. Never once does the plot or character development suffer for the sake of setting, but I felt so sucked into the town of Near that I could practically smell and feel and hear the moor, right here. I adored every moment well-spent on the grassy hills, the rain, the stones under Lexi’s feel, the old hut the Sisters lived in; it was all so wonderful and poetic. But when I say this story meant something to me personally,friends, I’m talking about the incredible care Victoria took while crafting these witches. If you ask any pagan or craft-practicing person, they’ll tell you that we’re not used to being painted in such a nuanced light, but here, that’s what I got, and it was wonderful. Now, I won’t spoil the story by saying if the witches are good or bad, or both, but what I’ll say is that there’s a pair of characters—two elderly sisters, who the town is convinced are old witches with no access to the powers of their youth—and they meant everything to me. I’m a sucker for the elderly mentor characters, regardless, but these women, despite being spurned by the town of Near for simply existing, spend their time crafting wards and blessings for the people who abuse them, and something about that just made me downright emotional. The idea that they could be so complex, and that they would continue to take care of people who didn’t deserve their empathy—that’s everything I didn’t know I needed from Magda and Dreska. The witches weren’t the only characters I adored, though; Lexi and Cole are both incredible in their own rights, but there were quiet, secret, ordinary heroes, too, in Lexi’s mother and her late father. I loved the stories from her dad, and I was cheering every time her mother stepped up to help her or protect her. I just fell so ridiculously in love with so many of the citizens of Near, just like I always do with V’s characters, and I never wanted to leave them. I feel like The Near Witch is the sort of story I’m going to reach for over and over again, for years to come. It is the most gorgeous kind of fairytale, yet it feels like the kind of thing that’s just odd enough to be real, and I mean it when I tell you that this was easily one of the best books I’ve read all year, and will undoubtedly go down as one of my favorite books, period. Thank you so much to Titan Books for providing me with this finished review copy in exchange for an honest review! It’s such a lovely re-release, too! 😀 I hope you get to read it soon! What an amazing review, Destiny! I know how much you love Victoria’s writing, and I am so glad that her debut didn’t disappoint. I am almost tempted to pick this up, and I am not the hugest fan of her writing overall… you have power, my friend! Yessssss, let the TBR-increase flow through you. 😈 Seriously, though, I wonder if you might like this more because I think it’s a lot more quickly-paced and action-packed than the Shades series, and I feel like I remember you telling me you thought those books dragged, right? If I’m remembering that right, I would LOVE to hear your thoughts on this one!! Thank you!! Me too, I was worried I’d have to shell out an arm and a leg for an out of print copy and then this happened and I was so relieved haha! Can I just say…Wow, to this review? Like amazing job Destiny! I haven’t read anything from this author yet (though I own so much from her) but your review makes me want to add it to my TBR…like immediately. ❤ LAV LAV LAAAAAAAAAAAAV this! Thank you!!! ❤ This is exactly the kind of comment that just makes my whole night 😭💕 Victoria is a goddess among mere mortals and I will stan her FOR. E. VER. I really love the cover for this book! 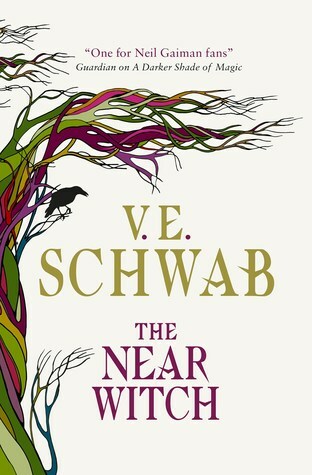 And this post definitely has me craving the atmospheric writing that I already know Victoria Schwab does so well. I like the fact that this review made me want to read it without giving away almost any part of the plot! Isn’t it lovely?! I think they did such a good job with this new cover. And thank you! 😀 Success! I hope you love it. She’s such a queen!